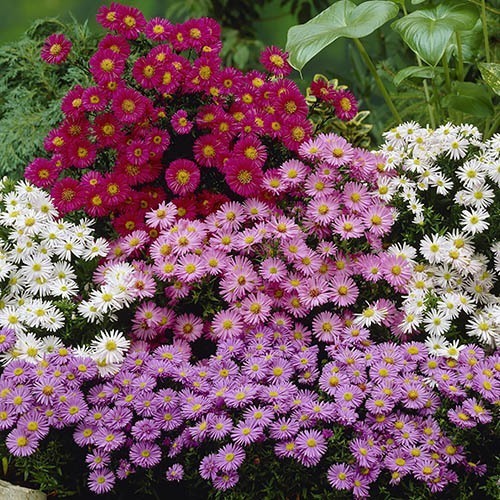 Brighten up your garden this summer with these beautiful asters. They’ll flower throughout summer in a gorgeous mix of colours – purples, pink, whites and reds. The 'Island' series is very compact and ideal for pots or smaller gardens, yet is very tough and hardy too. The eye catching flowers bloom for a very long period and will attract a whole host of beneficial pollinating insects to your garden in summer and into autumn! These hardy perennials are easy to grow and will form clumps in your garden. They’ll die back each winter and regrow in spring – getting bigger and better each year! They’ll perform brilliantly as a central feature in a tub or container, or for in mixed borders or raised beds. Supplied as a collection of 12 mixed jumbo plugs (2.5 - 3.5cm diameter) to flower in Autumn and beyond. Plant straight out into pots or borders.